She dreamed college would change her life. 10 years later, was she right? For Katy Sorto, college seemed like the way to a different life. But she had no idea how hard it would be. This piece, the first of two parts, originally appeared on American Public Media’s APM Reports. Read the original article and listen to the radio program in the player below or on the Educate podcast. When Katy Sorto graduated from high school in 2008, many of her friends and family asked her the same question: How do you feel? “Like it’s something big,” Katy remembered. In some ways, it was a big deal. Katy, who grew up in New Carrollton, Maryland, a few miles outside of Washington, D.C., was the first person on her mom’s side of the family to finish high school. Lots of her friends had dropped out. She wanted to have a life like that. To get it, she was going to go to college. 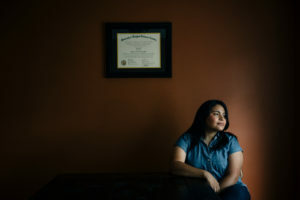 She’d nurtured that dream while working her night job cleaning offices at a law firm in D.C.
As she was emptying waste baskets, she’d notice the diplomas on the walls of the lawyers’ offices. Katy liked to imagine the lives they had. “They’re rich, they have money, they have beautiful offices, and I’ve been seeing pictures from their weddings, and it’s beautiful,” she said. “It’s just, it’s nice.” She wanted to have a life like that. To get it, she was going to go to college. Back in 2008, I documented Katy’s first year at a community college in Maryland. She faced long odds. More than a third of community college students quit by the end of their first year. Just 15 percent complete a bachelor’s degree within six years — and the rates are even lower for black and Hispanic students. In 2018, I tracked Katy down to find out what had happened to her. This is her story. On her first day at the Takoma Park/Silver Spring campus of Montgomery College in September 2008, Katy was nervous. Luckily, her best friend from high school, Thalia Navarette, was with her. 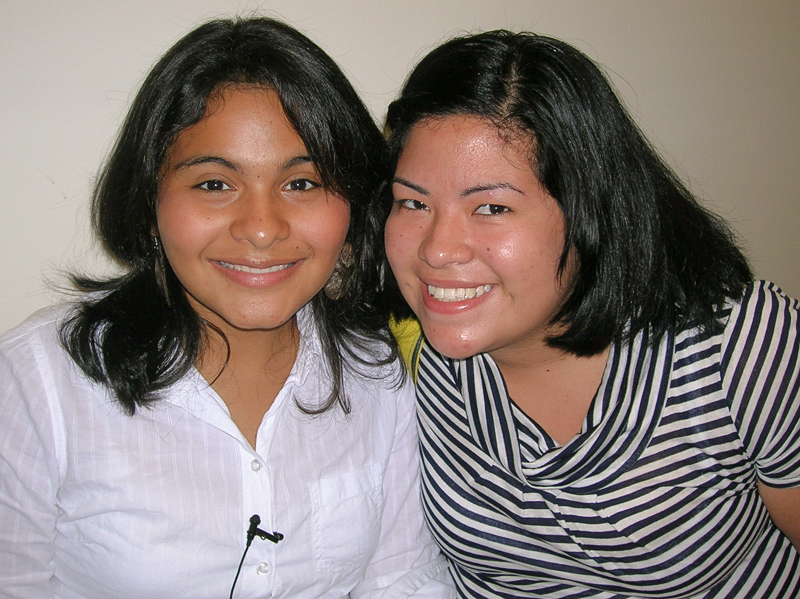 Katy and Thalia were both 18; neither of them thought they were ready for college. They said their high school teachers hadn’t expected much from them. Katy saw it a bit differently. “I didn’t pay attention,” she said. She regretted not trying harder. Katy was headed to her first class. She’d been assigned to an English as a second language class based on the results of a placement test. It wouldn’t count for credit toward her degree, and she would have to take six more ESL classes before she could take college-level English. Katy was born in the United States but moved to El Salvador with her parents before she started kindergarten. She returned to the States in middle school. And even though she went to American public schools for seven years, she ended up in the lowest-level ESL class at Montgomery College. Her classmates in the ESL class were new arrivals to the United States. During a class break, I assumed Katy was going to tell me she’d been misplaced. She couldn’t possibly belong in an English class with people who’d recently arrived in this country. As we walked to the campus center for a snack, Katy noticed a maintenance worker emptying trash bins. “Buenos dias,” she called out. Then to me she said, “Somebody’s going to be doing that for me” someday. “My God, I gotta work hard for that,” she added quietly. By the middle of her first semester, Katy was still cleaning offices at night. And she was helping her mom out a lot, translating things, taking her younger siblings to appointments, going to their parent-teacher conferences. Katy has a younger sister and two younger brothers. She wanted them to do better in school than she did. Katy was worried about money, too. She had financial aid but something had gone wrong with some paperwork, and she received a bill for $800. Plus, there were other costs associated with college that she hadn’t thought of — transportation and books. Katy lived with her parents. Her mom ran a home day care; her dad worked in construction. They couldn’t afford to help Katy with tuition. Katy’s goal was to become a high school counselor. “I know that being a counselor doesn’t make much money,” she said. “But I have a desire to help my community.” She wanted to work with immigrant kids. Katy planned to attend Montgomery College for two years, then transfer to a university for another two years to get a bachelor’s degree. But she soon realized that with all the ESL classes and some remedial classes she had to complete, it would take her a lot longer. Her friend Thalia was feeling frustrated too. “You get your hopes up saying, ‘Wow, in two years I’m out, I can move on to another college,’ she said. “But it’s all a lie.” Almost every day, she felt like giving up. Katy felt that way too. But Thalia and Katy said they couldn’t quit. 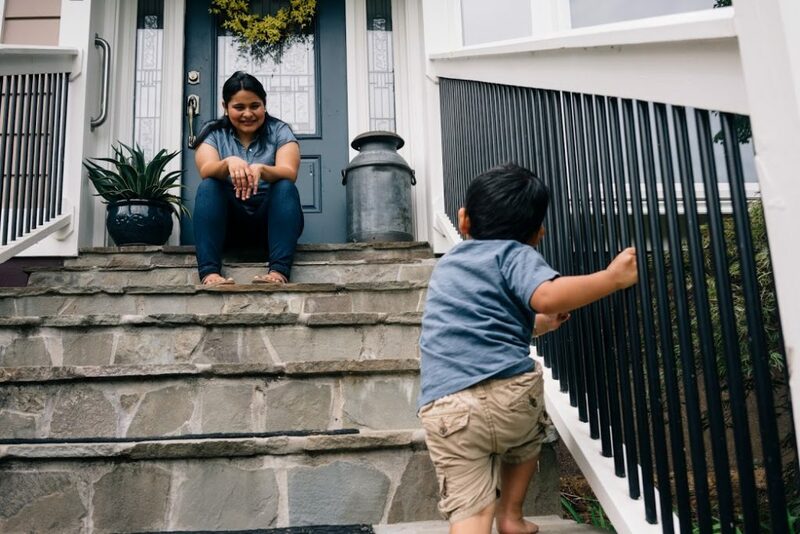 They would look around at what their friends and cousins were doing — having babies, living in tiny apartments, working at fast food restaurants and dollar stores. Going to college was Katy and Thalia’s way to avoid that life. 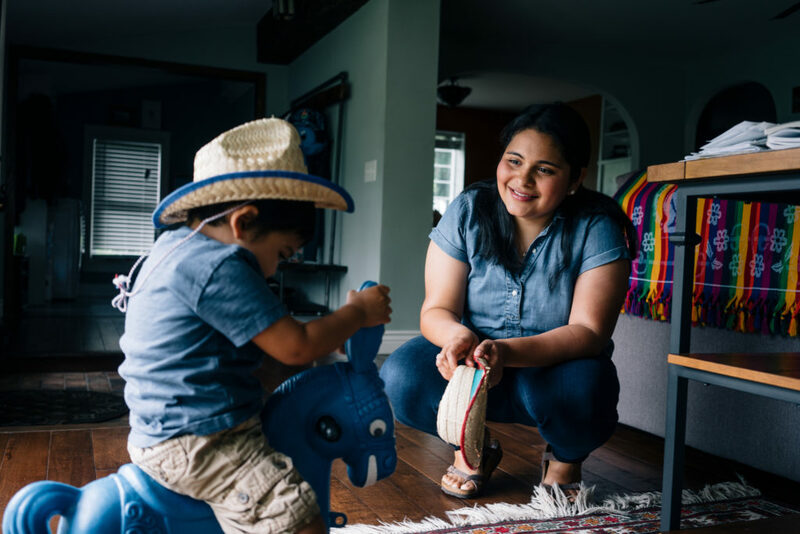 “Either you go to college and you do something or you stay home and you help your mom until your mom tells you, ‘OK, you got to leave,’ and then you have to go find a man and stay in like a little room, like a basement, and have their baby,” Thalia said. “Family, friends,” they chimed in together. Katy was determined to get a degree. She made it through her first year by visiting her professors during office hours and getting extra help. She said her dad still didn’t really understand why she was in college, but her mom was now quietly rooting for her. “She’s proud,” Katy said. In fact, when Katy got a $700 bill from the college that financial aid didn’t cover, her mom offered to pay half. But they didn’t tell Katy’s dad. “As long as he doesn’t hear about the money, he’s okay with college,” Katy said. When I finished reporting on Katy’s story back in 2009, she was in her third semester of classes, still at least two and a half years from completing all the credits she needed for an associate degree. And she hadn’t even started taking the required math classes yet, a prospect that terrified her. When I caught up with Katy again in 2018, we arranged to meet in the campus center at Montgomery College. She wanted to stop by the English department office. Some of her favorite people were there, staff and professors she loves plus her younger sister, Kimberly, who was the student aide in the department — the same job Katy had when she was a student. Katy was a student at Montgomery College for six years. “My parents used to ask me when it was going to be over.” It was finally over in the spring of 2014, when Katy graduated with an associate degree in general studies. Why did it take Katy so long? One reason: She was determined to have no student debt, so she was often working two jobs and fitting in classes as she could. But a big reason it took six years is that Katy struggled academically. She failed several courses and had to take them again. Her teachers noticed, and some suggested she might have a learning disability. In her entire K-12 education, no one had suggested she be tested. It’s not uncommon for students from low-income families to get to college and not know they have a learning disability, said Brad Stewart, the provost of the Montgomery College Takoma Park/Silver Spring campus. “If you’re from an upper middle-class family, and you’re a third-grader and you’re not doing well in reading, one of the things your parents are going to do is, ‘Oh maybe he [has] ADHD, maybe he’s dyslexic,'” he said. Those parents will push for their kids to get tested and pay for them to get help if necessary. Children from low-income families are more dependent on schools to identify and remediate learning issues. If schools don’t, those children fall further behind. Lots of her classmates did give up, including her friend Thalia. Katy wouldn’t go into details, but she said it was taking too long, costing too much money. Thalia is a stay-at-home mom with a baby boy. Katy and her partner have a son, too. Getting pregnant almost derailed Katy’s dream of getting a bachelor’s degree. After graduating from Montgomery College in 2014, Katy transferred to the University of Maryland, Baltimore County to pursue a degree in social work. Near the end of her second year there, she found out she was pregnant. “I told my mom, ‘I don’t think I’m going to be able to do this,’ and she said, ‘No, you have to finish. I’m going to be here to help you. '” Katy’s mom took care of the baby and, in May 2017 — at the age of 27, nine years after she started college — Katy completed a bachelor’s degree in social work. She didn’t say whether her dad cried at graduation, but he did take the entire day off from work to be there. And that was a huge deal, she said, because he almost never takes days off. Katy is a stay-at-home mom now. Finishing college with an infant was so stressful and exhausting that once she was done, she needed some time to relax and be with her son. Fortunately, her partner makes a good living — he owns a home remodeling business — and he and Katy recently bought a house. She doesn’t have to work, but she wants to. She’s still hoping to be a school counselor someday. But like a lot of women who can afford to stay home when their kids are little, Katy’s feeling a bit lost about how to get back into the workforce. Ten years ago, when Katy was cleaning those offices at night in D.C., she was dreaming of moving up, making more money than her parents, doing better. Though she’s not currently using her degree, she doesn’t regret the years she spent in college. In fact, one of the things she learned is how important it is for children to get a good education starting young. Her little boy is 2, and she is already thinking about where he’ll go to kindergarten. She said she plans on having just one child so if she has to pay for her son to get tutoring or go to a private school, she can. She wants her son to go to college if that’s what he wants. But if he wants to skip college and take over his dad’s business, that’s fine with her, too. Column: Would I pass the college remediation placement test? Emily Hanford is senior education correspondent for APM Reports, the documentary and investigative journalism group at American Public Media.